Do you love take out? I definitely and reach for the Asian take out menu frequently. Not only does it offer such convenience but it tastes so good too. I used to think the only way to get really good fried rice was by ordered take out from our local restaurant. 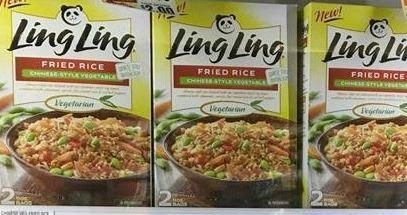 Then, I discovered Ling Ling Fried Rice. 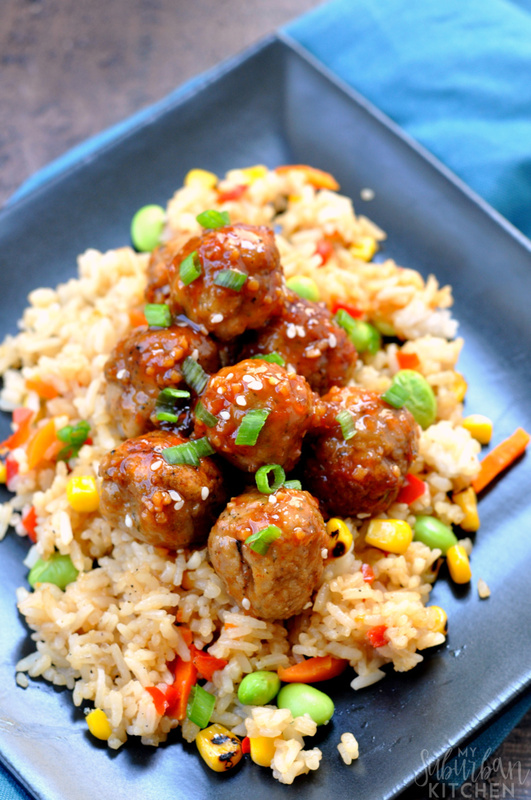 I pair the Chinese-style Vegetable Fried Rice with my favorite sriracha glazed meatballs and leave the take out menu in its binder! 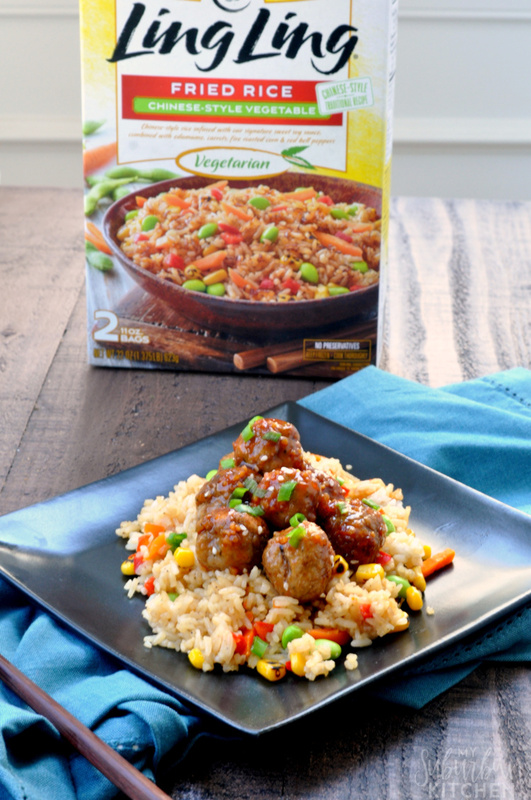 Ling Ling Asian entrees deliver superior flavor and exceptional taste thanks to their infusion cooking method. This means that each grain of rice and noodle is infused with Ling Ling signature sauces. The Ling Ling Fried Rice comes in five unique versions including Yakitori Chicken, Yakiniku Beef, Thai-style Chicken, Chinese-style Vegetable and Bibimbap Beef. They are all so good that I honestly can’t even tell a difference between the Ling Ling Fried Rice and what I order from our local restaurant. 1. In a small sauce pan, combine sriracha, soy sauce, rice vinegar, honey, ginger, garlic, sesame oil and lime juice. Bring to boil, whisking frequently, and then reduce to simmer. Simmer, whisking occasionally, for 8-10 minutes or until slightly thickened. Remove from heat. 2. Toss cooked meatballs with sauce. 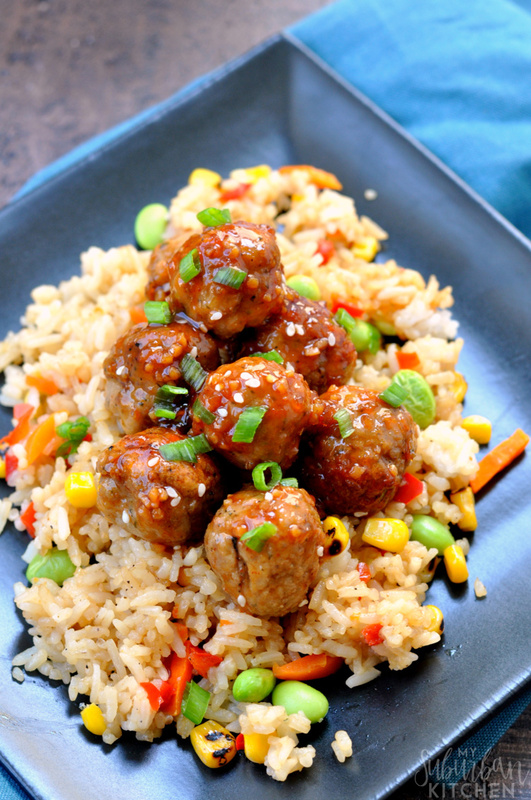 Sprinkle meatballs with sesame seeds, if desired and serve over fried rice. 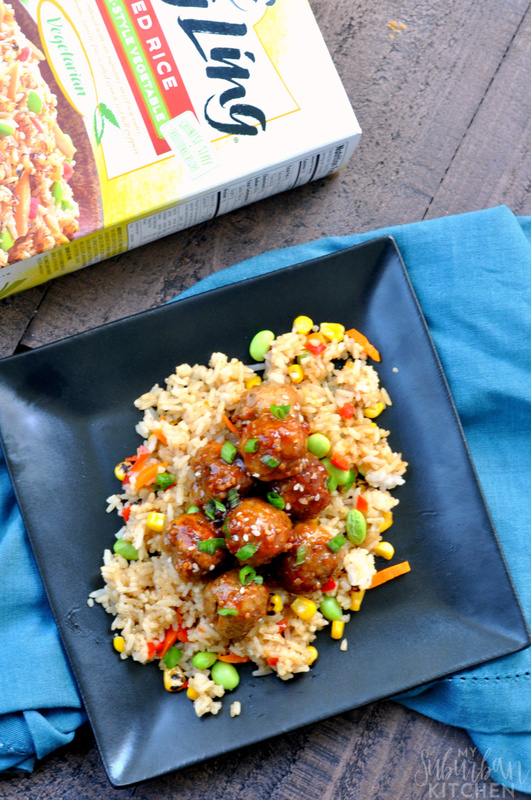 This meal is ready in only 15 minutes which makes it a perfect weeknight meal! 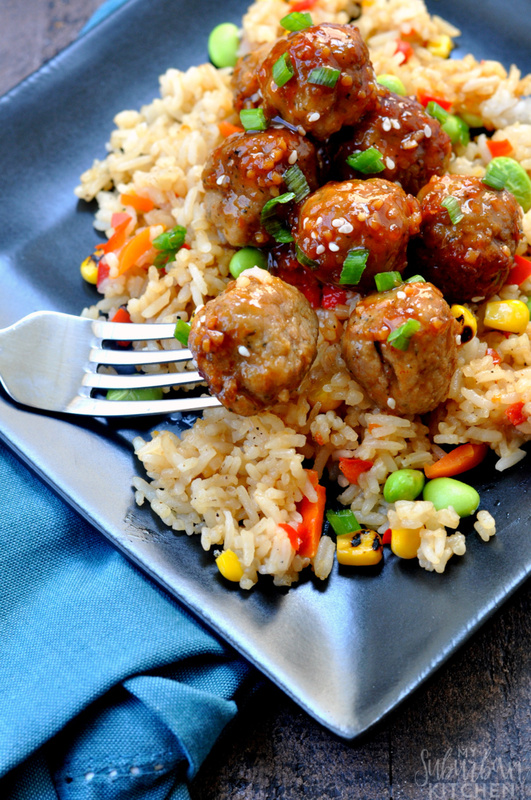 You can cook the meatballs, sauce and fried rice simultaneously which helps it get done super fast. I mean you can’t even get your favorite take out that quickly! Plus, I love taking the leftovers for lunch too. I love the Ling Ling Fried Rice but I am also excited to try their new Noodles and Dumplings. 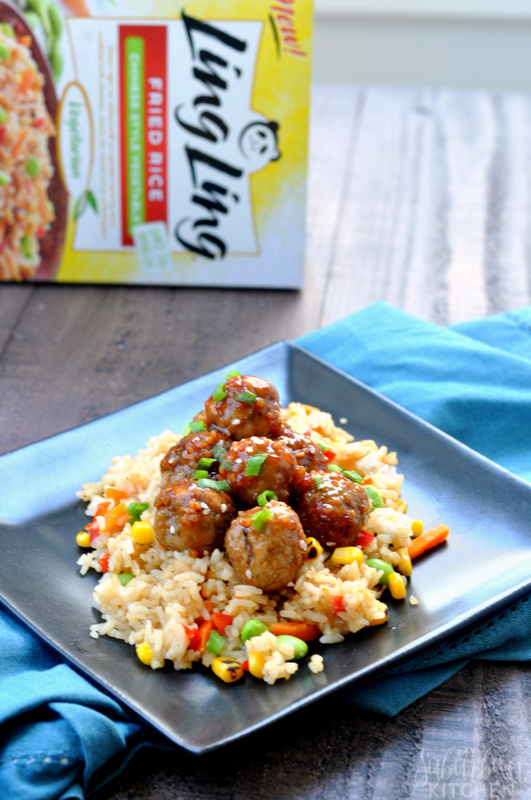 If you want to try any of the Ling Ling Asian Entrée items, be sure to visit here to get a $2 off coupon and then look for their products in the frozen aisle at your local Walmart store.